← The Role Of Altitude, Azimuth And Zenith Distance In Astro Navigation. Greenwich Mean Time (GMT) is the local mean time anywhere on the meridian of Greenwich. In other words it is the Local Hour Angle of the Mean Sun on the meridian of Greenwich. Since the Greenwich meridian is used as the base meridian from which the longitude of all places on Earth are identified, it provides the link between the LMT of a place and the LMT at Greenwich (or GMT). Example. In the diagram below, imagine that we are looking down on the North Pole. G represents the position of Greenwich on the Earth’s surface. GP represents part of the Greenwich Meridian (0o). MP represents part of the meridian of longitude 45oW and M is a point on that meridian. The meridian of the Mean Sun, for a very brief instant, coincides with the meridian 45oW. and so, at that instant, the Local Mean Time at point M is noon. At the same instant, the Local Hour Angle of the Mean Sun at Greenwich is 45o. Therefore, the LMT at Greenwich must be 3p.m. since the time difference for 45o is 3 hours and Greenwich is to the East of M.
It follows that the Greenwich Mean Time must also be 3p.m. 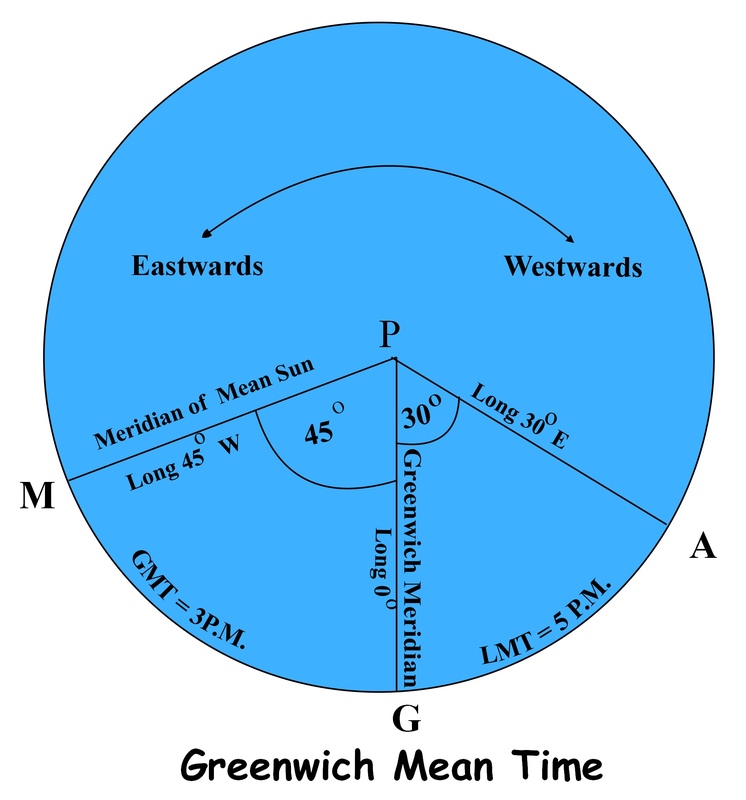 (since GMT is equal to the LMT at Greenwich). The LMT at point A must be 2 hours after GMT (since the time difference for 30o is 2 hours and A is to the East of Greenwich). Therefore, the LMT at point A must be 5p.m. Greenwich Hour Angle (GHA). The angle between two meridians of Longitude can be expressed as an hour angle. The hour angle between the Greenwich Meridian and the meridian of a celestial body is known as the Greenwich Hour Angle. 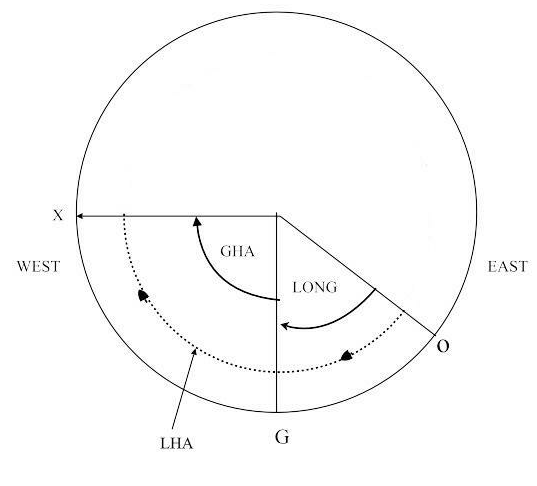 The Local Hour Angle between an observer’s position and the geographical position of a celestial body can be found by combining the observer’s longitude with the GHA. G represents the Greenwich Meridian. Because in this case, the observer’s longitude is east and because LHA is measured westwards from the observer’s meridian to the meridian of the celestial body, LHA is equal to the longitude plus the GHA. Example 1. Convert 0840 GMT to GHA. Step 1. Convert GMT to arc. Step 2. Convert to GHA. Example 2. Convert 1530 GMT to GHA. Note. Because GHA relates to apparent solar time and GMT relates to mean solar time, we must take the equation of time (EOT) into account when converting GMT to GHA. Therefore the next example includes a calculation for EOT. ∴ GHA = GMT – EOT. Step 1. Convert 0415 GMT to arc. This entry was posted in astro navigation, Astro Navigation Topics, celestial navigation and tagged astro navigation, celestial navigation, Equation of time, navigation, Time. Bookmark the permalink.